﻿ News Bharati - Reviewing the financial confirmations, the Ministry's way..! News Bharati - Reviewing the financial confirmations, the Ministry's way..! Reviewing the financial confirmations, the Ministry's way..! Mumbai, February 9: “Interim Budget 2019 has been the culmination of a journey; there are at least a hundred more things on the table, though the Government could lay out what it did in four years and what it envisioned for the next ten years, being an Interim Budget, there was very little headroom available for what could be announced in the Budget”, said the acting Finance Minister Piyush Goyal while addressing at the first post budget industry interaction on Friday, Mumbai. Interim Budget reflects the nation’s support for the programmes and policies of the government. Thanking the industry and the financial sector for their contribution which has helped the government bring about a foundational change in the way the country thinks and works, Goyal said that it is only fitting that the government and the industry together celebrate what the nation has achieved in the last five years and chart out the vision for the future. The budget has adopted a holistic approach, for the welfare of all sections of the citizenry. The government is working towards ensuring 100% sanitation, 100% electricity coverage, health care for all, housing for all and for transforming India’s villages while retaining their soul. Referring to Pradhan Mantri Kisan Samman Nidhi, the Finance Minister said that the farmer support announced in the Budget has been the outcome of the large amount of taxes which the government has collected post demonetization, after GST and after the collective efforts made by the nation for formalization of the economy, widening the tax base and improving both direct and indirect tax collections. “The farmers have played an important role in this, giving us food security like never before. 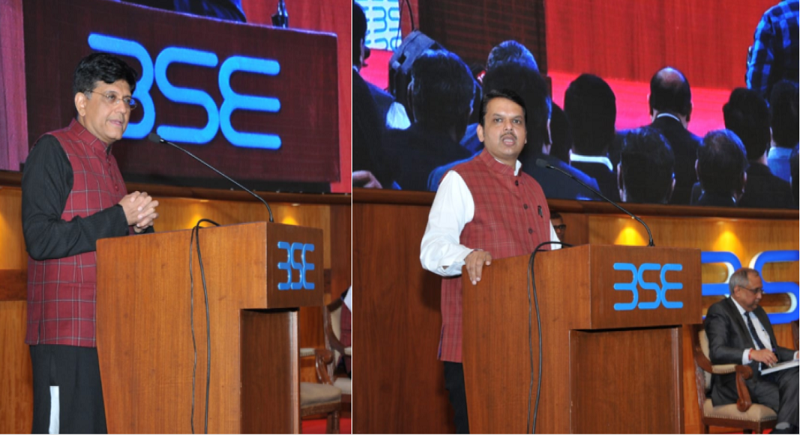 Hence it was only fitting that particularly the small and marginal farmers were given this support, The nation is doing nothing but its duty by extending this support for the farmers”, he added in presence of CM Devendra Fadnavis at BSE International Convention Centre. Announcing that the scheme becomes effective from December 1 of the current year, the Minister said that the first installment will be given soon. Noting that almost 42 crore people are engaged in the unorganized sector, Goyal said that the government is working towards bringing more of them into the fold of Provident Fund and to provide free health care to them through Ayushman Bharat - Pradhan Mantri Jan Arogya Yojana (PMJAY). Meanwhile Maharashtra CM Fadnavis claimed that the tough decision taken by the Government of India has brought India on the growth path. “While various governments talked about poverty alleviation, their approach was based on expenditure. Government under the leadership of Prime Minister Narendra Modi has adopted an approach which is based on investment and not expenditure alone. Interim Budget 2019 has charted out a clear vision make India a trillion dollar economy by 2020”. India continues to be the fastest growing major economy in the world for the last few years, and is now the world’s sixth largest economy. This represents growing and robust demand for economic opportunity for industry and businesses. RBI’s assessment that inflation will be contained has opened up space for policy action. It is an indicator for industry to focus on growth. Various steps have been taken to enable financial institutions to support credit growth. The country has also moved up in Ease of Doing Business Ranking by close to 50 places, this been made possible due to a slew of reforms undertaken by the Government, he signed off.